At a cafe on a Saturday, Debbie and Gary Williams sit with their coffee opposite each other holding a magazine and iPad in hand respectively. There is a smattering of newspapers – national, state, local – at a nearby communal table for thumbing by patrons. Gary, director of Christian Management Australia, and Debbie, an interior designer, who have two teenaged children, are representative of a growing cohort of middle-aged media consumers whose daily media consumption habits navigate all mediums – online, radio, newspaper, magazine, TV – delivered via tablet, computer, phone and in print. For them, it is not so much how they get the news, but who is delivering it and when. "Most of it, probably 50 per cent, I access on the iPad – SMH, the Melbourne Age, Christian Today and the ABC are probably the main ones, plus a myriad opt-in emails that send me to sites via links," says Gary. "My starting point is the iPad first thing in the morning for newspapers, then in the evenings it's TV, and radio (ABC 612AM) spasmodically while driving through the day." His wife, meanwhile, will thumb through a Country Style, checks in with her favourite blogs most nights and will read The Sunday Mail each week. "As far as news goes, in the evening I watch the Channel Nine news, I enjoy snippets on blogs and what I catch on the radio. I do like 4BC," she says. It has been a long time since newsprint had a monopoly on delivering the news of the day, but with the imminent and significant demise of two Fairfax printing presses making headlines this week, never has it been so clear that one type of media cannot cater to all people at all times. The diversification of channels and proliferation of portable technologies means the media companies must adapt or be damned. It is too late for some. While many will prefer the feel of a newspaper under their fingers, of an impressive broadsheet spread before them on a table, others, like Gary and Debbie, will happily adapt to the changing times. But their children may very well never have the opportunity to do a delivery run for the local newsagent, let alone buy a newspaper themselves. As the Gen-Y comedian Josh Thomas put it to Good Weekend after cancelling his newspaper subscription back in 2010: "I thought I should read The Age and be engaged with the world. But they come every single day. Every single day! I hadn't realised what a commitment it was!" "Even though it’s our job [and one we love, on most days!] to read newspapers, Mediaweek is getting close to cancelling print subscriptions. But not because there is a better digital alternative – there’s not, except at The Age. We are growing weary of the papers arriving after we go to work, of climbing around the front of our property in the dark looking for them, of having to unroll acres of plastic and we are tired of not being able to read inserted glossy magazines without having them curl up into a little tube every time we let go of them." Newspapers require commitment from everyone: from the consumer who physically goes into a newsagent or supermarket to buy the paper with spare change, to the newsagent who organises deliveries for local subscribers and more to offload at the corner store, to the sub-editing teams who take sloppy copy and fit it perfectly into column inches, to the journalists who chase leads and put their careers on the line each week, to the printers who take all the sheets off the presses each night and bundle them into trucks for delivery nationwide (did we mention the delivery truck guys, too?). And now newspaper publishers are signalling that they're almost ready to call it a day. One thought that comes to mind: what will become of this newspaper making, selling, buying and reading community? "It was the best of times, it was the worst of times," begins Charles' Dickens historical novel A Tale of Two Cities, and so begins the story of Australia's two leading newspaper publishers, Fairfax and News Limited, who this week announced unprecedented changes to their operations brought on by the digital age. It has been a long time coming but it is a time of unprecedented change, we are told, though since the day God scribed the Ten Commandments to Moses in stone tablet form, we have seen quills turn into pencils, and pencils into electronic pens and keyboards and fingers tapping at screens, and letters turn into emails and text messages and Facebook updates, just the same. In all this, the art of conversation has been challenged, but has not been entirely lost, just as the Protestant reformation did not annihilate the church: it made it more diverse. Predictions have been made: the local rag will remain, perhaps even grow and thrive in these disconnected times, though there are moves to centralise newsmaking operations into city locations (what then of the country discourse? ), with their "super-desks", while the metro dailies will be all but gone within five to ten years, remaining in weekly or Sunday format only. Though many of us would still prefer to swill a feather quill into an ink well and scribe away at an old parchment, and the newsprint lover will find it hard to part with the broadsheet, media companies, which exist for profit beyond the ABC, are marching ahead with the times, not caring too much about who they leave behind (and therein lies an opportunity: who will pick up the slack?). Amidst the sweeping changes is the move to distill the venerable Sydney Morning Herald and The Age into a tabloid size (though content, we are told, will not be compromised). Given that reading a broadsheet is equated with broader thinking, one might suggest that this move, coupled with the ravenous desire to take more content to the internet, will cripple thinking in this country of ours by fitting it into fewer column inches. "At some places I’ve worked, writers have been expected to churn out words like machines, often getting RSI, and not having enough research or thinking time. Research rarely throws up definite answers — it just steers writers in a direction and they still need time to think and make a leap of faith and hope their judgment is correct. That can’t happen quickly." Will the long-form story, the investigative journalism, the sprawling analysis be lost in the mire of the net that feeds on the most popular link-bait of the day? The Fairfax/News Australia story is a narrative of comparisons, but also of the increasing online domesticity, and potential dumbing down of news and conversations. What of the enduring nature of newsprint in national agenda setting and the core values of newsmaking? 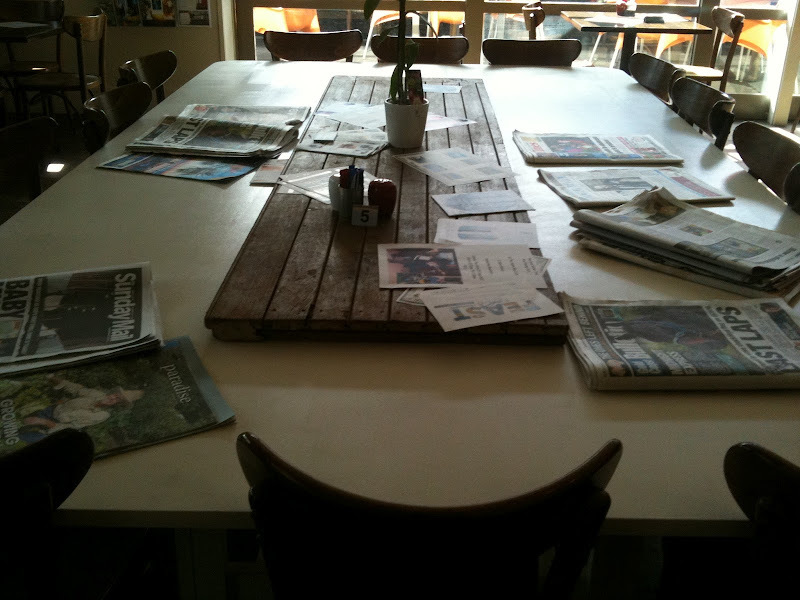 Will the demise of print rip at the very fabric of community news sharing? For those who stroll to work without looking down to their iPads while tuned into their iPods, perhaps not (look up and see the world around you – it's really rather wonderful), but for those who make efforts to engage beyond the screen, the exchange of news and views will likely continue. The biggest news story of the week is a case in point. 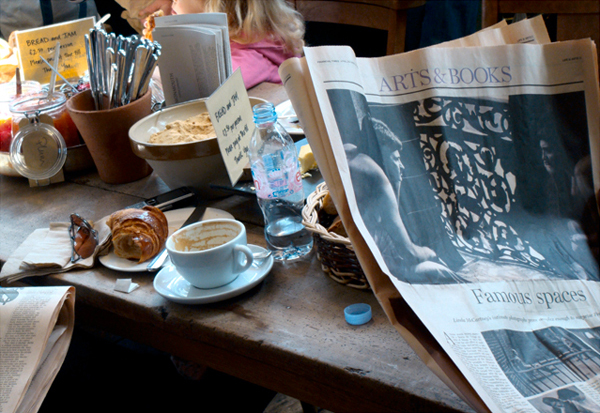 Everywhere, in office spaces, cafes, newsagents, over the backyard fence, on the streets and the blogs, there is discussion of newsprint: will it last into the next decade? Most people are personally involved and affected by the changes. 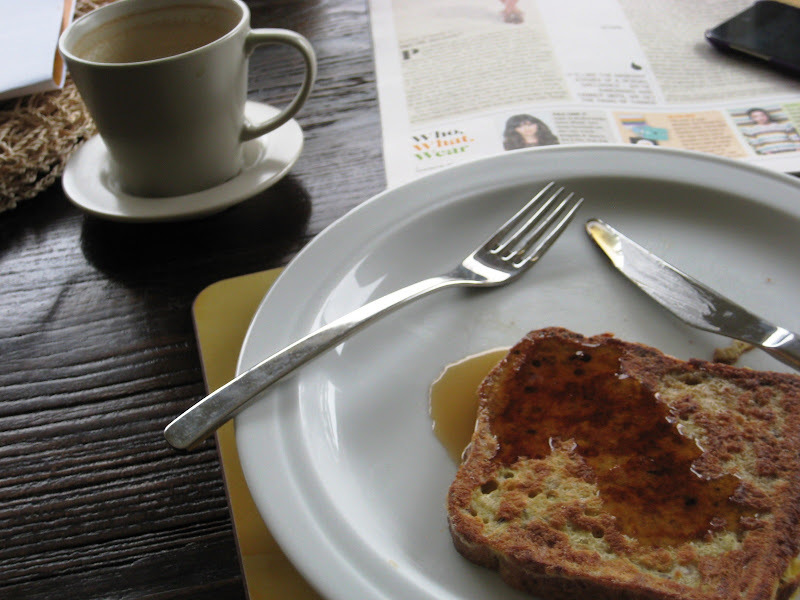 After all, what would a weekend or morning be without the spread of a broadsheet before us on the table together with jam toast and tea (or is that just me?). The nostalgic reminisce about the presence of print in their personal histories. Fond memories of mum and dad flicking through the day's news, being amused by political cartoons, pulling out the comics for the kids, sending in misprints for amusement to Hey Hey It's Saturday's "Media Watch" segment, sticking beloved columns to the fridge; being accosted by a broadsheet on the bus, making a fuss, are these days about to end? These are not print, nor printer, friendly times. Let's not pretend, "Readers' behaviours have changed and will not change back," said Fairfax chief Greg Hywood, cutting straight to the chase. "As a result, we are taking decisive actions to fundamentally change the way we do business." In the interim, media organisations and the venerable voices that emanate from them do risk becoming not the bastions of stability they once might have been but ships without sight of the lighthouse lost in the night. As Fairfax Media moves to transition towards the medium of the internet, it is erecting paywalls around its online content to make consumers a part of a two-way transaction, and plans to reduce its city mastheads The Sydney Morning Herald and The Age to a 'compact' style by March 2013. The latter decision has made some readers bristle, which may cause pain for the titles' circulation (perhaps write-offs are expected), though beyond the loss of a snobbish accessory is the news that the company is closing two of its major printing plants and laying off approximately 1,900 staff over three years to consolidate its workforce, which will be reduced by one-fifth. It is a significant move for the publishing house first owned by Englishman John Fairfax, who bought The Sydney Morning Herald in 1841, and has gone from being wholly owned by a capitalist to partly owned by another capitalist who seeks to increase her interests, financially and editorially. The company has faced tumultuous times before but has been truly in the financial doldrums since 2007. This is partly due to the free issuing of print content online, which has failed to be offset by significant advertising dollars. Display ads in print have traditionally been big business, and for that reason alone the papers will stay in circulation; it's the classifieds that have all but disappeared online. The past five years have been unfortunate for print overall, as the GFC conspired to compact the problems caused by the internet. Companies trimming their own bottom lines turn first to the marketing and ad budget to see where savings can be made, hence fewer dollars to throw at the newspapers, while still more were siphoned off into the online world. Australia's longest running magazine, the news and current affairs title The Bulletin was closed by ACP Magazines in 2008 in the wake of the financial shakeout. But at the same time new titles have entered the fray: The Spectator Australia was launched in late 2008, and so too The Week. Oftentimes, as we may find with the challenge to Fairfax, the demise of one entity of wide girth simply gives birth to territory for others to explore. But the numbers have been crunched and the readers (77 per cent of whom engage with Fairfax online; only 23 per cent in print, says the company) and shareholders have, apparently, spoken. To point out the obvious, the internet is home to a diverse range of generalist and specialised content, produced both locally and overseas, including Fairfax's own smh.com.au, which sits atop Nielsen's poll of most popular Australian news sites, and The Australian Financial Review, which has been charging for digital content since 2006 but has adjusted its pay model since to boost its numbers. As noted in the Finkelstein Inquiry's analysis of the newspaper industry's structure and performance, despite the emergence of radio and television, newspapers have remained a major and highly profitable medium for the distribution of news and advertising. It was the Depression that first impacted the demise of what was once 26 capital dailies with several closures and moves by the most prolific print businessmen (including Sir Keith Murdoch) to acquire a number of titles. The ongoing decline of newsprint was helped along by the increased accessibility of the TV, but social factors were also at play. All afternoon papers closed in the 1980s – we now had the evening news at home or radio on the commute. Currently, our metropolitan and national newspapers, comprising 11 titles, are controlled by just four owners: News Limited (which controls 65 per cent of circulation), Fairfax (25 per cent), WA Newspapers and APN. News Australia (formerly News Limited) swiftly followed the Fairfax announcement, two days later coming out with news of its own restructuring and acquisition efforts which, in light of the fracas that ensued after the Fairfax announcement, makes the Murdoch press look almost virtuous (quite the turn of events). 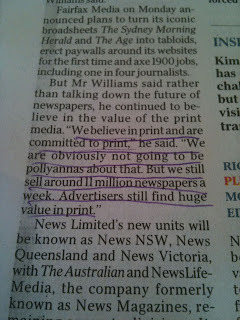 No word yet on redundancies but there has been a commitment to stay in print, after all many Aussies are still shilling out their daily coins in exchange for a Tele, Courier or Advertiser, though CEO Kim Williams has added a "we are not Pollyannas of the print media" qualifier to his vision of the future. Notably, Fairfax is not wholly ditching print for digital just yet: digital is a priority but, says Hywood, it would not yet be economical to move to a digital-only media model. All this, 572 years after a German called Johannes Gutenberg invented the printing press. In the US, since 2007, 200 large and small newspapers have closed or eliminated their print editions. Overall daily newspaper circulation in Australia has declined by more than one-third in Australia over the past 27 years, from 4.52 million to 2.75 million, though the population has steadily increased. Despite these gentle assurances that the sky is not about to fall in on print, the reality remains that many people at the coalfaces of print news production face imminent retrenchment or displacement within the industry, a hark back to times when machines began to overtake men in factories. The printers, the sub-editors, the journalists (the bakers, the candlestick makers) who keep the oil burning well into the evening so we can read the next day's papers and feel well informed about a cross-section of the significant things happening in the world are at this time uncertain of what's to come. Job losses stretch out before them like funeral procession. So as we go about musing on the media, lamenting the idea that one's broadsheet will be a shadow of its former self, let's not forget those in the trenches, like we are want to do when everything is new and cool and oh-so exciting, or else changing against our will. A minute or two contemplate also the fate of the elderly, the techno-incompetent, the print-preferential who begrudgingly face going into the future without their familiar friends: the papers, which go hand in hand with milk and bread, tell us who is alive and who is dead, who is having fun and who is on the run, what is happening and what has yet to...begun. "At the Herald's old home at Broadway, those of us on the graveyard shift in the fifth-floor newsroom would feel the floor vibrate as the massive presses in the basement fired up; when freshly printed papers were brought upstairs for checking, the ink would come off on our hands," writes The Week associate editor Rob Barrett, who has in his possession the second-last hot-metal front page of the Herald circa 1984. "The stone, where the pages were assembled by compositors, was an absorbing world of hands-on skills and Heath Robinson machines that turned melting lead ingots into type. This production drama was replaced years ago by the muted tapping of computer keyboards and the electronic transfer of pages to presses six suburbs away." According to the 'Fairfax of the Future' plan, Fairfax is the market leader on digital platforms with The Sydney Morning Herald and The Age attracting 7 million unique users each month, a 25 per cent increase over the last five years (in contrast to the falling share price and print circulation over the same time). The Finkelstein Report notes that in 2010, total revenue of the newspaper market was $5.2 billion, of which $3.7 billion (70 per cent) was derived from print advertising, $1.3 billion (25 per cent) from circulation sales, and $260 million (5 per cent) from digital advertising subscriptions. Much has changed within two years as media companies like Fairfax have moved to capitalise online, launching aggregated networks to ease the process of buying for advertisers and creating web entities to suit its formerly print-friendly demographics (the coveted ABs). Fairfax suits believe the only way forward is to trim down costs to boost the bottom line, as well as moving increasingly towards being fully digitized, leaving behind its "legacy" business: print. Digital subscriptions will roll out in the first quarter of 2013, using a metred model with a base level of free access (i.e. you use more, you pay), while editorial will be integrated across digital, print and mobile. As such, the printing facilities at Chullora and Tullamarine are proposed to close by June 2014 with the printing of metro papers reallocated to the Fairfax printing network. Along with selling 59.4 million of its Trade Me shares, this will help Fairfax to achieve annual savings of $235 million by the financial year ending June 2015; $215 million in savings by June 2014. Those who work the printing presses, represented by the Australian Manufactures Workers Union (AMWU), have been quick to defend their position and plead their case. "We know there are changes confronting the (newspaper) industry and we’ve been working with the company and their competitors to confront some of the long-term issues," said the union's print division secretary, Lorraine Cassin. "However we don’t take it lightly when they come out with the stroke of a pen and make this announcement. Nor do we accept the position being bandied around that the only publication from now on is digital. Digital is only one stream. The community still wants printed newspapers." Newsagent blogger and owner Mark Fletcher responded by encouraging newsagents who are lagging behind to move quickly to change their business models by diversifying their offerings. "There are newsagents still running very traditional businesses – retail, distribution and retail and distribution," he blogged. "These folks need to move quickly. They are in a race with a tsunami of change." However, Fletcher also noted in talking to the ABC that some newspaper sales are on the up, including foreign language titles (up 8 to 15 per cent, year on year, he says) and localised mastheads, while newspaper revenue (approximately 5-6 per cent of retail agency income, he says) has been declining year-on-year in line with shrinking circulations. International mastheads who are making the marriage of print and digital work are seeing overall advantages for profitability. The Christian Science Monitor's digital traffic is, for example, five times higher than before its 2009 ditching of daily print for weekly and move to concentrate more of its efforts online. It's case studies like these that make publishers hopeful. What's more, newspapers are making major headway in the developing world and markets like China. "Shenzhen Press Group in Southern China accounts for 90 per cent of the local market share of print media (Guangdong News, May 18, 2007)," notes a recent IBISWorld report, elucidating the ironic contrast with Australia's ostensibly democratic press. "In Australia, News Corporation controls about 70 per cent of the national and metropolitan newspaper market, with Fairfax Media accounting for about 23 per cent and the remaining player in this market (West Australian Newspapers) accounting for the rest." According to IBISWorld, growth in newspaper circulation revenue in developing countries has been offset by a decrease in newspaper circulation revenue in the developed world. More than 500 million people around the world buy a newspaper every day, and about two billion people read a paid-for newspaper, and newspapers account for about 21 per cent of the global advertising market, but industry revenue is expected to decrease at an annualized 3.5 per cent in the five years through 2012. Roy Gleenslade took to his Guardian blog to give Australian journalists a reality check: "For some strange reason, as I discovered when I was last in the country, Australian journalists seemed to be oblivious to the effects of the digital revolution." Of the 1,900 Fairfax layoffs, initially in the form of voluntary redundancy, 20 per cent (300 jobs) will be from editorial. Newsrooms are already titchy with some senior editors making public declarations about editorial independence from big-business influence. Communications Minister Stephen Conroy has weighed in on the side of press freedom by accusing Gina Rinehart of trying to turn Fairfax into the "Mining Gazette." Never has the economic reality of commercial enterprise been quite so apparent to journalistic idealists. While at News retrenchments have been flagged, so too have "new skills hires" to soften the blow, as newsrooms face the prospect of becoming 24/7 environments. Restructuring plans are underway with a focus on TV and video and streamlining editorial and sales operations at its newspapers. In an announcement News went public with its conditional proposal to acquire 100 per cent of the shares in Consolidated Media Holdings (CMH), which would give it 100 per cent ownership of Fox Sports and 50 per cent of Foxtel. The company has also acquired Alan Kohler's Australian Independent Business Media, the online publisher of Business Spectator and the Eureka Report, which trade in business community credibility, in a deal estimated to have cost News between $21 and $30 million. Kohler has said he has permission to maintain his presence on the ABC, which is good for him. In a discussion with ABC radio, as well as in the corporate media release, News CEO Kim Williams highlighted News' commitment to print and a transparent change process in order to ameliorate fears of a situation similar to Fairfax, thereby coming off as the good guy. We are told the company sells approximately 11 million newspapers each week, and, despite the cost of printing, distributing, shipping and selling them, it will continue to do so. Williams made note of the pervasive accessibility of print, which will keep it in circulation for the foreseeable future. "In 2020 I'm very confident that we'll be producing very fine newspapers and they will be being consumed very actively across the length and breadth of Australia," he said. 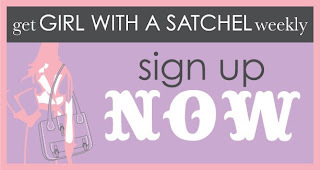 "We reach over 14 million readers on a weekly basis on average... There seems to be some kind of dramatic desire on the part of some media organisations or media commentators to call the death of print because it amuses them to do so." Ah, what Dickens would call, "being received, for good or for evil, in the superlative degree of comparison only". What would media be if not for stark contrasts in theme? Flagging the investment in Methode, a publishing platform that will allow News to create content once and publish it many times across platforms (print, online, tablet, mobile, smart devices, broadcast), Williams said that the company's digital arm, News Digital Media, would be incorporated into each of its five newly-created divisions rather than operating as a separate entity, thus giving its journalists the tools and impetus to generate highly trafficked online stories. 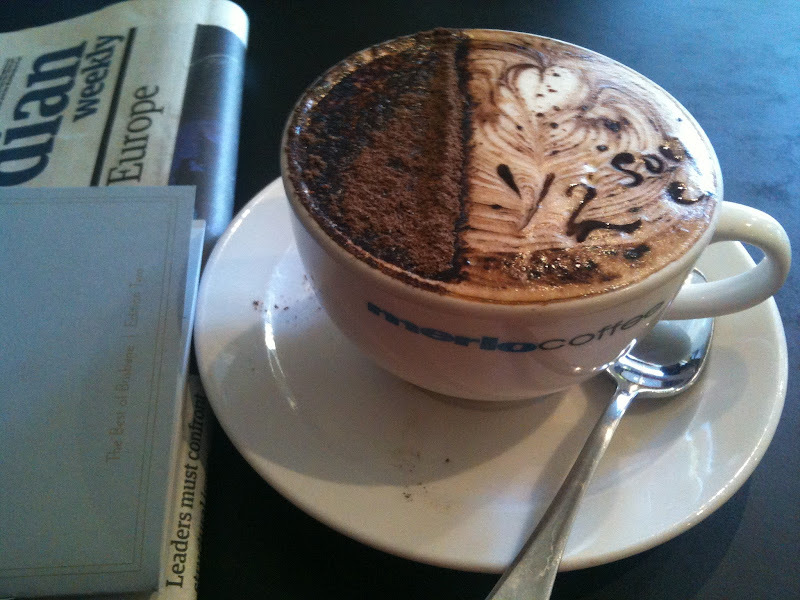 As part of the plan, The Australian and magazine business NewsLifeMedia will continue to operate as separate national divisions, while three new divisions have been established in NSW, Victoria and Queensland, housing state-based operations and three hubs for "the skills and expertise of the company’s metropolitan, regional and community operations" while lowering duplication. "These state-based and national divisions will be enabled to provide great journalism to our customers. We will provide the best local stories and national stories from across our entire networks. We will continue to lead in breaking stories, filing exclusives and provoking debate and change through our high quality commentary and opinion pieces," said Williams. "The new operating model is designed to empower staff to work smarter and faster. We will upskill our central functions and eliminate wasteful duplication. We will hire new people where required, but regrettably some roles will become redundant. At this stage we cannot say how many roles will be made redundant as full details will be resolved with the implementation. Although there will be retrenchments, many roles will be retired through natural attrition." The media landscape now is not so much a matter of print versus online, but the ability of publishers and mastheads to use their credibility and distinctive voice across all domains to attract enough readers to sustain their business. Unfortunately for them, many people are making and curating their own news via Facebook. One prospect to consider is the art of dissecting a newspaper. In the process of absorbing the day's news stories, one might come across a catchy headline or image that piques the interest, and prompts further reading, exploration or sharing. Google and social media outlets are aiding in the highly personal delivery of news and analysis, but what might we miss in the process? Communication theorist Marshall McLuhan, who predicted the advent of the worldwide web 30 years before it was launched, said "the medium is the message". But with the mediums so diverse, and the same messages proliferated across the spectrum with a different spin, increasingly the messenger will become the important factor: who is delivering your news? Are they trustworthy, reliable? How print will continue to steer and influence the national conversation, by virtue of its journalism, remains in question, particularly as public interest tests are bandied about. But newspapers already have critical clout: newer online news sites, such as The Conversation, may entice the establishment but the penetration of opinion and ideas as far and wide as newspapers and the national broadcaster the ABC is not easily contestable. The ability to continue to produce quality (read: expensive) stories – and tell people's stories – in the context of a digital environment that thrives on up-to-the-minute news, and the cost ratios of doing so, proposes profound implications for public discourse. We have seen politics suffer under the pressures of spin, Twitter and headline making, what then of the implications of the new media paradigm for the broader community? People will take confidence, and their news, from those sources who meet their needs, and appeal to their worldview persuasions, in a timely fashion without compromising on integrity across all mediums. Increasingly, as many clamber to take their share of the online advertising pie, new funding models will have to be looked at, while others will look to creating whole new and marketable online communities. In the mainstream, compromises may have to be made at the business end to keep the funding of journalism functioning. Gina Rinehart could very well be looked at in the same light as philanthropist Graeme Wood, the founder of Wotif, who supports The Global Mail's journalism. 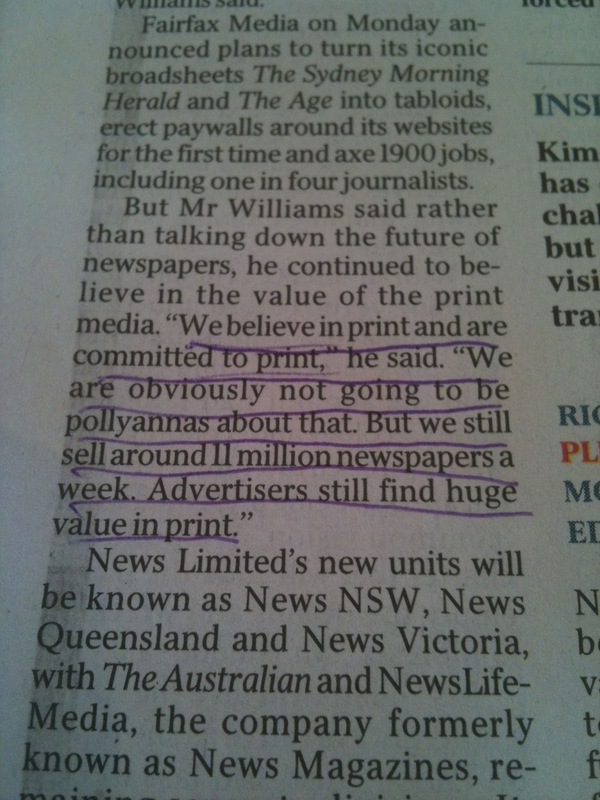 Ironically, the environment could be the big winner in the Fairfax move to digital over print. Market realities versus independent journalism will continue to be talked about as fit and proper persons tests are debated in parliament – given the pervasive influence of the internet, and everyone's capacity to be a news producer and critic, the test may very well be appropriate for anyone who calls themselves a publisher. Then there are consumer habits to consider. We are creatures of routine. We like our comforts. And as the Baby Boomers – the vast proportion of our population – enter retirement they will be looking for community engagement, which may very well start on the newsagent floor. One woman, in her 50s, whom I meet walking to the newsagent on the street laments the passing of the print age as much for the languid reading of a paper on a Sunday morning as their being handy fire starters. Newsagent Shane Stevens told the ABC: "Personally the Age is pushing things a little bit too quick," he said. "Yes, things will go digital down the track but not everyone is into that as yet. A lot of people like the touch and feel of being able to come in and grab a newspaper and sit down and actually read that paper." Progress, economic efficiences and new technologies do not necessarily lead to a better world. But the writing is on the wall for the messengers of the earthly order of events: the kids are friendly with their tablets and iPhones and Microsoft and Apple will be sure to find new ways to keep us endlessly shopping, buying, entertained by the latest digital something-or-other (perhaps people will tire of the need to update their technology constantly? We'll see). "Yesterday was an important day because suddenly our future seemed to become just a little clearer. 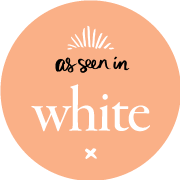 Some of the old thinking that has held us back for a decade or more seemed to evaporate, allowing us to see a different kind of media landscape and to view it with a little less fear." When we bring that which threatens or scares us out into the light, see it for what it is, we sometimes find that the great Wizards of Oz are just normal men looking to maintain their importance, or just their jobs, who now have to admit, 'Oops, we made a mistake, this is the way we should go now, before it's too late'. The fact is that some media companies were so afraid to embrace the digital age, due to the perceived cannibalisation of their trade, that they failed to make significant inroads, while others had to play the sit-and-wait game, knowing their online entities were performing well in traffic terms, because of a general reluctance - on behalf of consumers and advertisers - to fund their new-media business. What seems to be the recurrent theme is that this is a time of necessary and predictable change – growing pains for an industry succumbing to a new age, albeit belatedly. As with other tumultuous times, such as those in which Dickens set his novel, some will rise and others will fall, but eventually the media landscape will settle. In the meantime, perhaps the elderly and the broadsheet buyers will need a gentle assurance – 'Your newspaper will still be there when you wake up tomorrow morning' – and also a helping hand in getting the digital lowdown so they won't be left behind (I have a pensioner father, I know it will be painful for some). We'd probably also do well to appreciate print while we can. One thing is for sure, despite all the tumult in the world of print, the sun will still rise and set and the moon will still shine down on us, along with the stars, and they will continue to do so without us reporting the facts. Still, you don't know what you've got 'til it's gone, so it might surprise to find there are peaks in print circulation for a time. Always the Pollyanna, and no shame in that. Wow Erica what a thoughtful, wide-ranging piece. Think it's the best I have read on this topic. And you are just one person, writing, researching and proofing your own work. No wonder newspaper empires are in trouble!